Tharsis Montes is the largest volcanic region on Mars. It is approximately 4,000 km across,10 km high, and contains 12 large volcanoes. The largest volcanoes in the Tharsis region are 4 shield volcanoes named Ascraeus Mons, Pavonis Mons, Arsia Mons, and Olympus Mons. 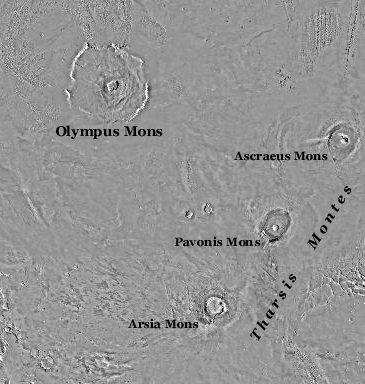 The Tharsis Montes (Ascraeus, Pavonis, and Arsia) are located on the crest of the crustal bulge and their summits are about the same elevation as the summit of Olympus Mons, the largest of the Tharsis volcanoes. While not the largest of the Tharsis volcanoes, Arsia Mons has the largest caldera on Mars, having a diameter of120 km (75 mi)! The main difference between the volcanoes on Mars and Earth is their size; volcanoes in the Tharsis region are up to 100 times larger than those anywhere on Earth.